Rhinestones is one of the printing techniques for textiles. At present, simple and accessible to all, it allows reproducing “relief” drawings and logos with the crystals (rhinestones) available in different colours and sizes. 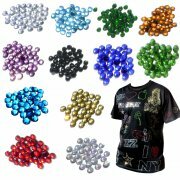 The rhinestone can be used alone or in association with other printing methods as flex transfer or digital printing. Very fashionable, the rhinestone, by its originality and “prestige”, is more and more used for the clothing and accessories. logo) with rhinestones, after its preparation on the computer, the first step is to reproduce it on a special support in form of holes. Once this template is done, you fill it with rhinestones, you take them off with the application adhesive tape. Then you transfer the logo on the garment with a heat press. Mask film and all the accessories to do rhinestones marking simply.